Balaji is passionate about creating ambigrams and does them free of cost if you request him. Do check him out. That’s the coolest thing I’ve ever seen. That poor guy is about to get buried with requests. Thank you for sharing thatI do like Indian, Arabic & Oriental caligraphy, but I think hindu and sanskrit do lend themselves more to ambigrams.So what would your namebe in english? Very cool. I first saw this done in Dan Brown’s Angels and Demons. Not a big fan of Brown (I never even read the Divinci Code), but I did like the ambigrams. That is really cool! I want one! Matt D.’s right – that guy’s gonna get buried!Thanks for stopping by my site!! I did hear about the Angels and Demons ambigrams, Oni. Would like to see what they look like. Thanks, Kelly! It will be interesting to see what yours looks like. Hi Bhaswati,This is really creative and beautiful! I went to the site to request my name to be done too. Thanks, Simran! I can’t wait to see what yours looks like. 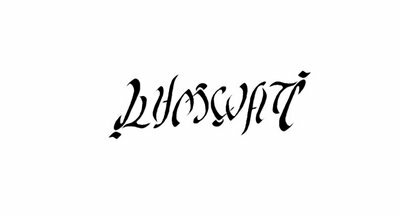 With a name so beautiful, I am sure the ambigram would be no less pretty :)Thank you, Jason :)Esther, aren’t these interesting? I just finished reading “Angels & Demons”! Other than the sixth ambigram, I didn’t feel as though the first five couldn’t be all that hard to forge! You all have got me so intrigued about the Angels and Demons ambigrams, Yoda. I have to see them now! Where do you find these kinds of things? You and Flood find the coolest links. We lay serious emphasis on goofing off, Scott 😉 Don’t know if Flood will kill me for this. LOLI really don’t remember how I chanced upon Balaji’s blog. But when I did, I was bowled over. I had no idea what an ambigram was until then. Here is the best one (sixth in the book). That’s is sooo cool. Thanks for sharing! Before I read your entry I didn’t even know an ambigram was called an ambigram but I researched it a little bit, I looked at the website you mentioned but I also had a look at the wordplay website which I actually got to by clicking on someone else’s comment. I had a look around and it has some tips on how to go about making your own ambigram: http://www.johnlangdon.net/adviceonambigrams.htmlSo I had a go and I’ve been making my own ambigrams. My favourite is the one I made for Juanita but my own one comes a close second. Anyways, I just thought I’d share.